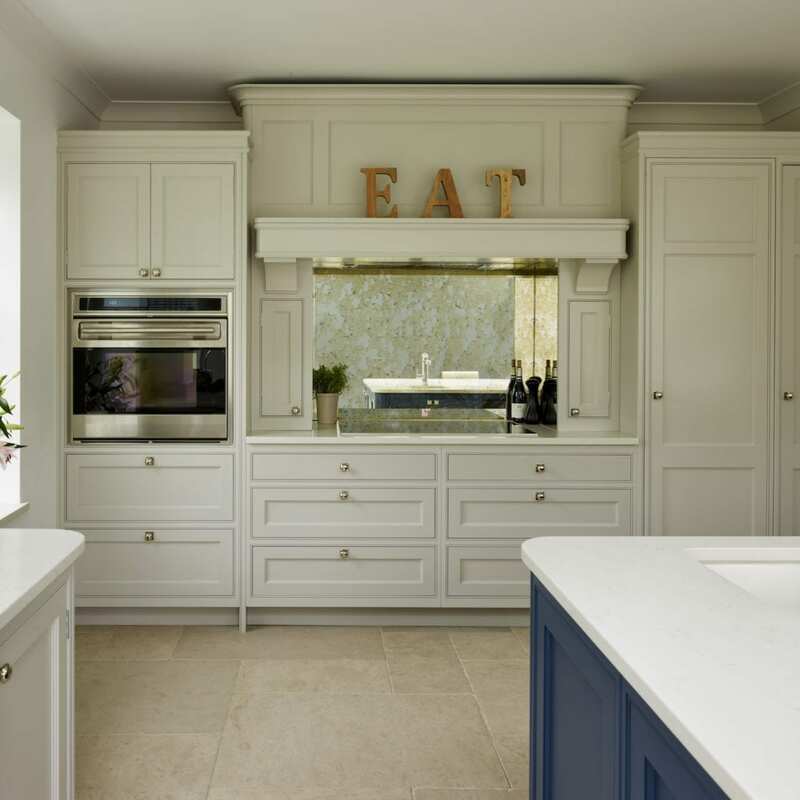 This case study aims to explore Grace and Henry’s Tillingham kitchen from a design perspective – what the brief was, how we interpreted it and the end result. Grace and Henry’s home is a stunning Georgian country house in a quaint Essex hamlet. From the wide hallways to the large, heavy doors, when we visited their home for an initial site survey the inherent quality throughout the building was evident, and it was clear that the new kitchen had to continue the same level of quality, precision and grandeur as the rest of their home. Grace and Henry were looking to create an open plan kitchen which incorporated both cooking and dining areas, as well as a snug. To accommodate this, walls that previously separated a utility room were removed to create adequate space for the snug whilst French doors along the back wall were replaced with bi-folding doors opening onto the garden. 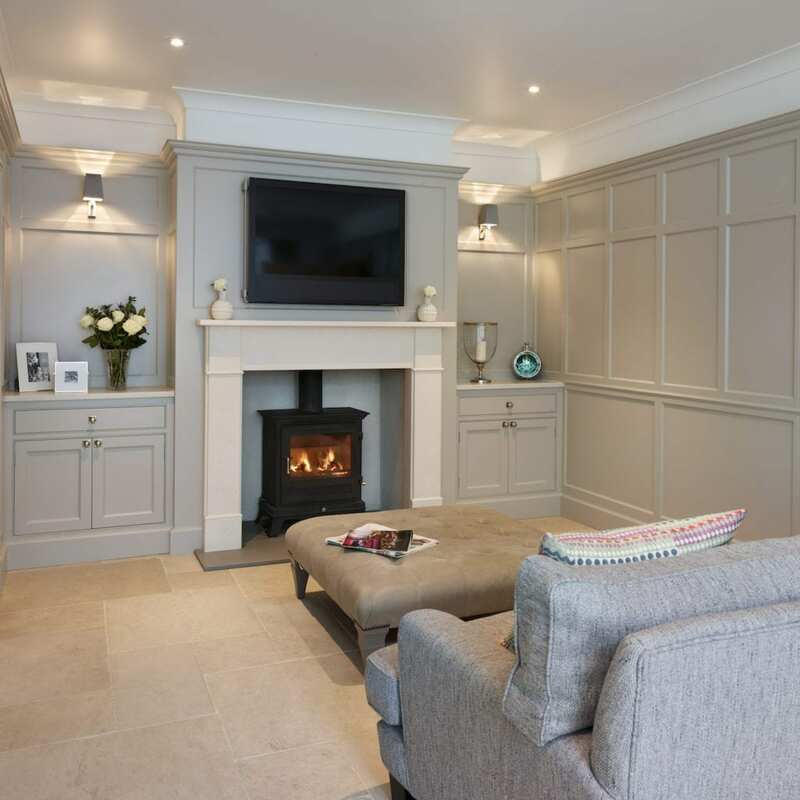 The main purpose of the building work was to create a large, family friendly room to enjoy with their young son. This family-centric view of the space was essential to our brief, though Grace was adamant that the kitchen and snug had to radiate elegance and sophistication whilst maintaining all the functionality of a family kitchen. The previous kitchen included an island which Grace and Henry enjoyed so they were keen for an island to feature in their new room. Similarly, the sink in the old kitchen was positioned directly in front of a window, looking out over the garden which Grace liked and wanted to keep. 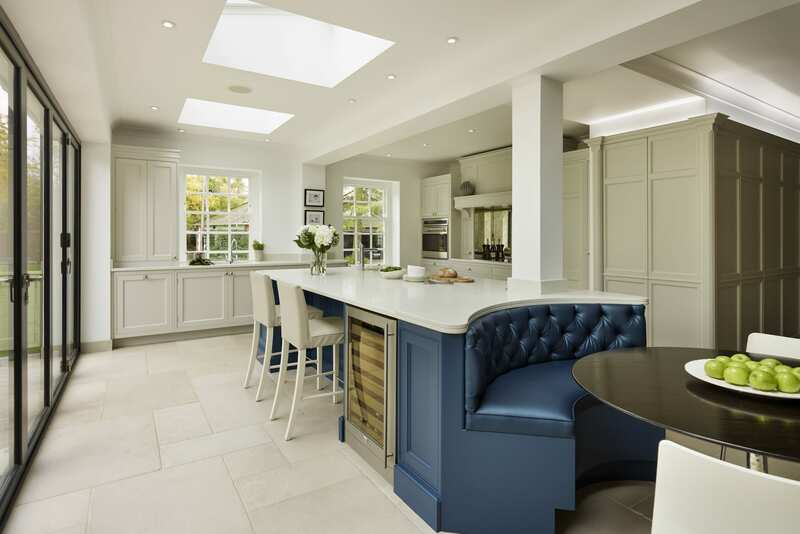 Aside from these two features from the previous kitchen that Grace wanted to integrate within the new kitchen design, we were free to suggest design concepts which would enable an open plan kitchen to enhance family life whilst maintaining a strong, elegant aesthetic. The island forms the core of the room and became a pivotal element early on in planning. 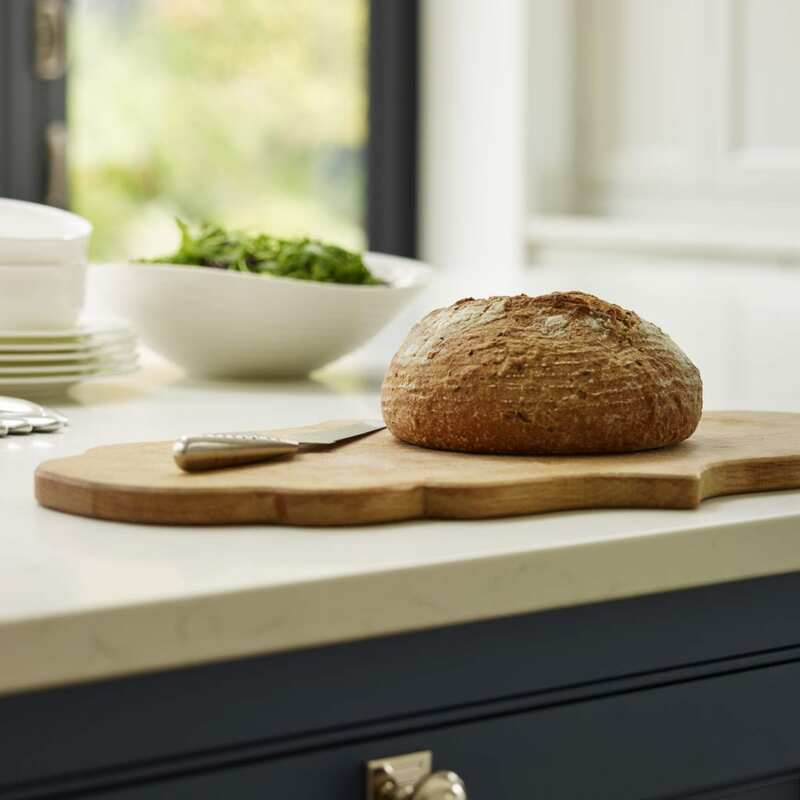 The new kitchen island is larger than the previous one and features two forms of seating – a breakfast bar and a concave banquette bench seat. 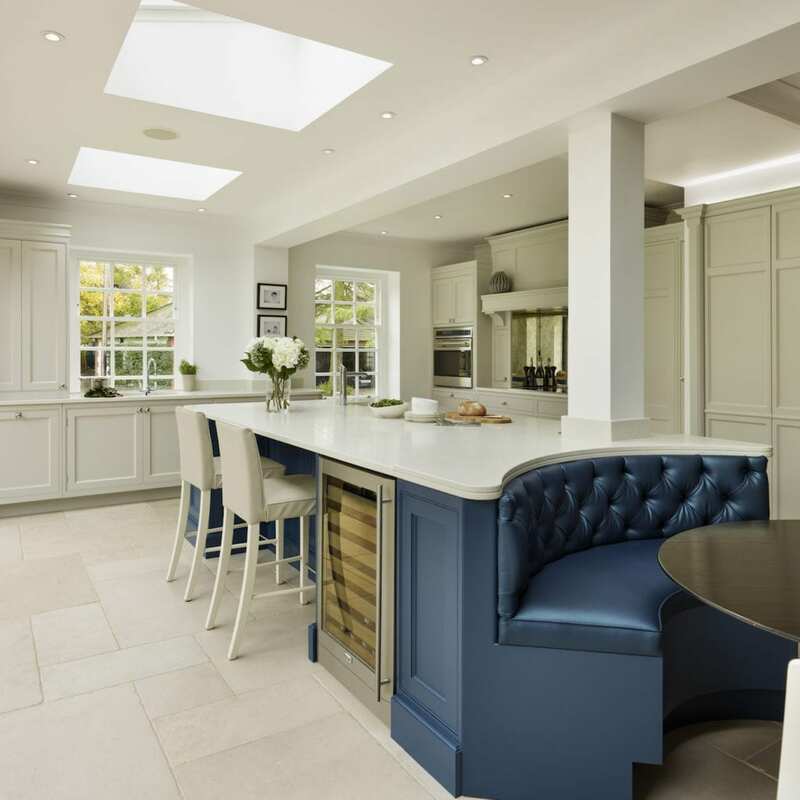 The deep buttoned leather bench seat curves around a dining table which Grace envisaged as a relaxed dining space for breakfast with their son. After visiting the Davonport showroom Grace and Henry’s wish list was swiftly topped with a pantry. 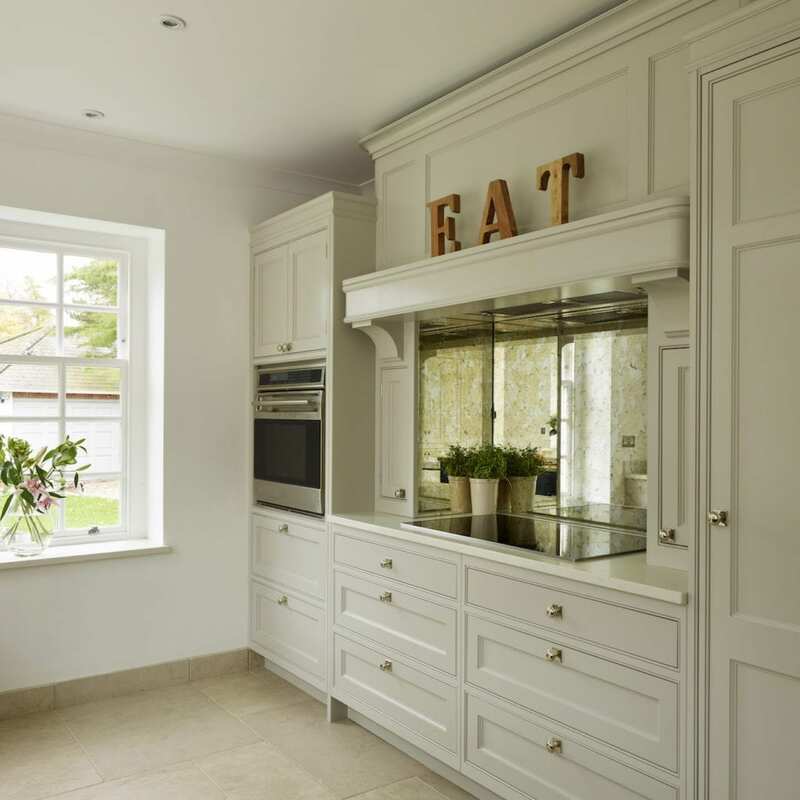 The Tillingham pantry in our showroom stunned them and consequently was factored into the design. 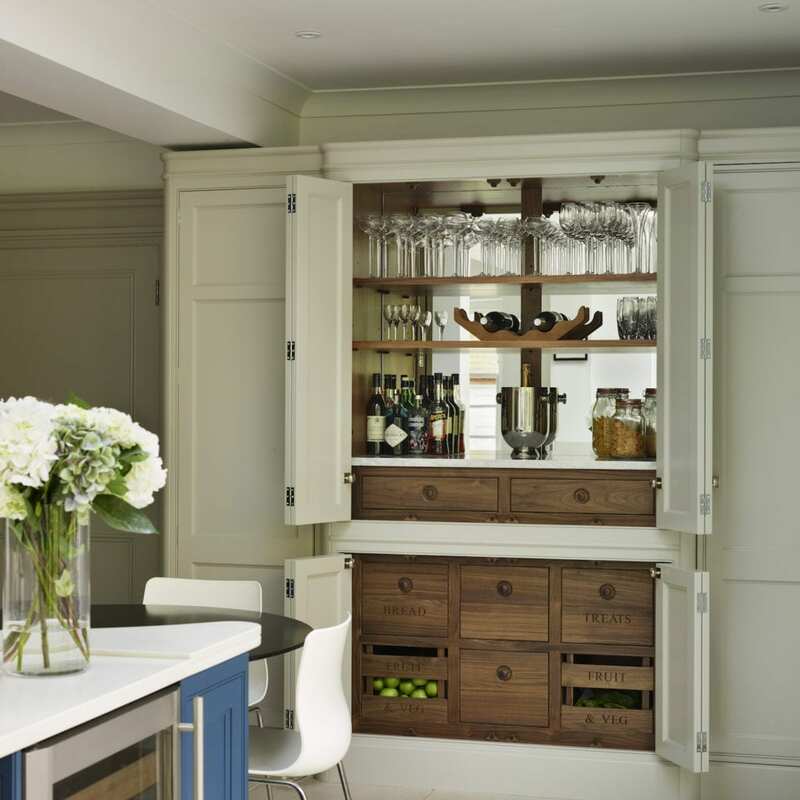 As well as looking spectacular the pantry provides useful extra storage. 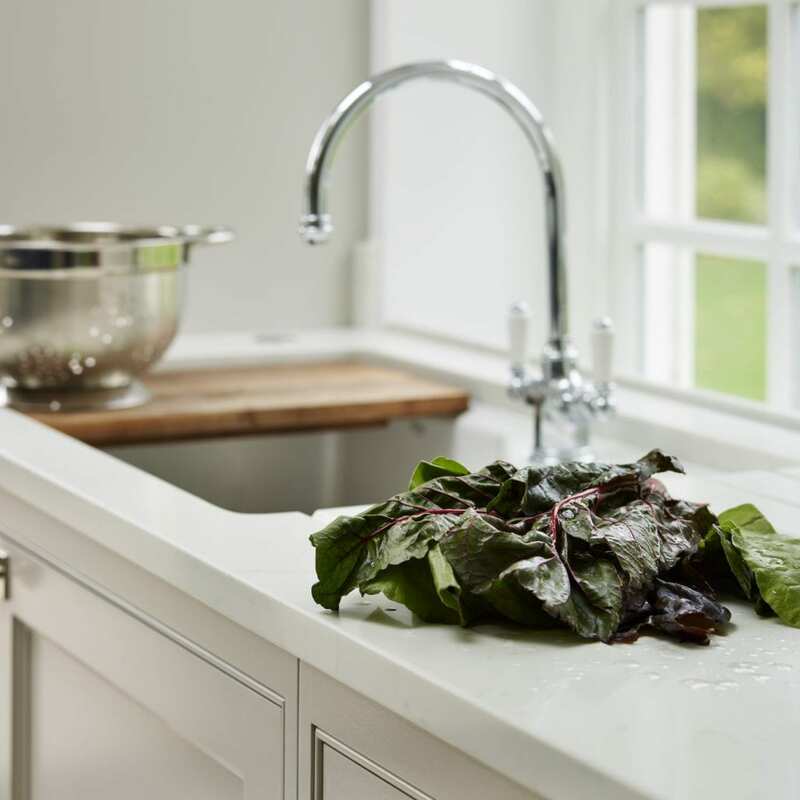 As Grace planned to use the top half mainly for glassware, crockery and bottles, and the bottom half for fresh and dried produce, we created bespoke vegetable crates and drawers made from solid walnut, hand carved to Grace’s specified wording. In order to place the pantry in its most ergonomic position we suggested blocking one of the doors into the kitchen which Grace and Henry agreed with. 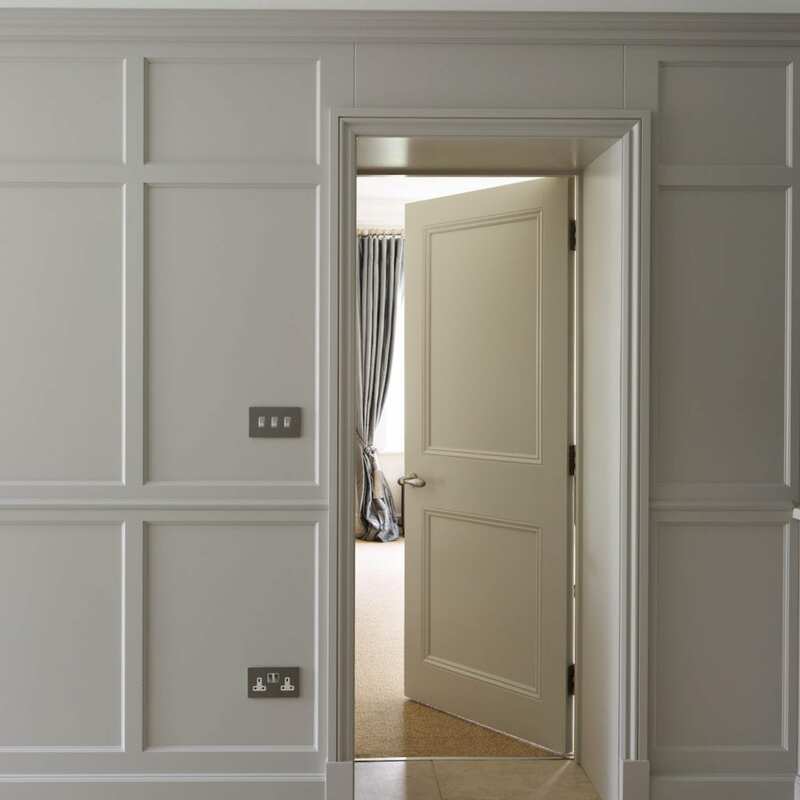 The real standout feature of the space and the aspect of the design that we most enjoyed creating is the bespoke wall panelling in the snug. 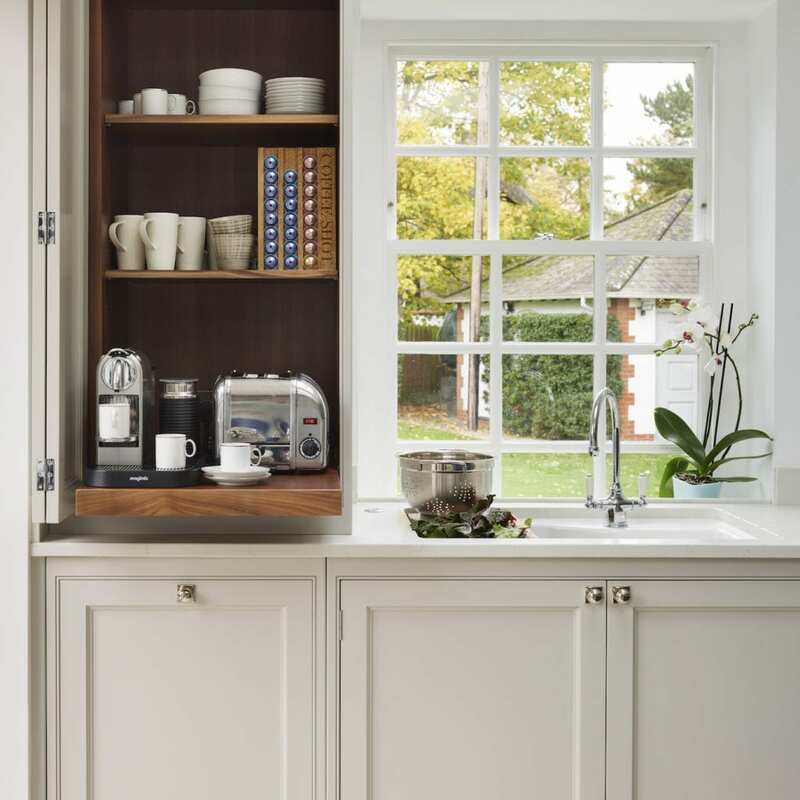 In order to encourage flow between the kitchen and snug the panelling was designed to mirror the colour and door style of the kitchen cabinetry. Grace and Henry’s dream of an open plan space with kitchen and living areas flowing freely into one another has been realised. Classic features such as the mantel and pantry provide the grand, elegant feel that Grace was so keen to achieve. 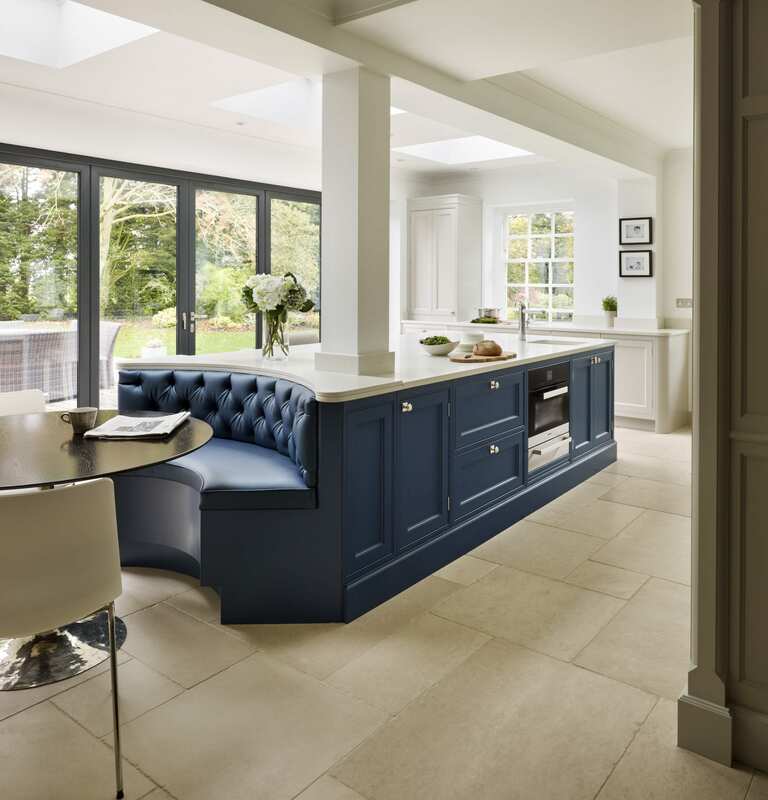 The striking blue used on the island introduces a contemporary edge in-keeping with the bi-fold doors and skylights. The impressive aesthetics of the room are matched by its practicality. Ergonomics and functionality remain central to the design, ensuring that the room is enjoyable to use day in, day out.